There are gigantic salt deposits under the state of Louisiana. Geologists tell us the salt dome under Assumption Parish is about the same size as Mt. Everest. 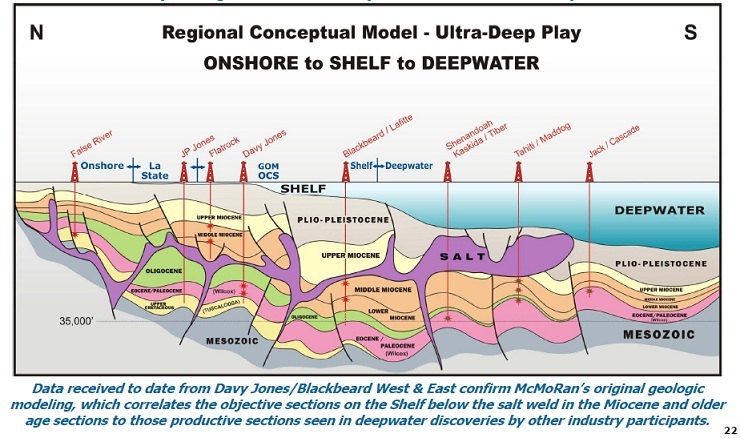 Some of the deposits are as deep as 35,000 feet as shown in this not-to-scale drawing. In fact, huge salt deposits are under large patches of the North American continent along the Mississippi River valley all the way up to Lake Erie. The city of Cleveland is sitting on top of a large salt deposit. Salt settled out of the water when these areas were part of the ocean as the continent of North America was forming. We have all seen what happens if you dissolve salt in water. It reaches a saturation point, where no more salt can be dissolved. At that point, the excess salt settles to the bottom. That process is still going on at the surface in places like the Great Salt Lake and the Dead Sea. Once the water evaporates, it leaves behind places like the famed Bonneville Salt Flats. The excess salt in the water in those formative years of this continent settled out into enormous deposits. The primary deposits of salt are deep underground, as far as ten thousand feet or more. However, like glacier ice, solid crystal salt becomes somewhat plastic under great pressure. At ten thousand feet, the overburden of rock and sediment creates pressures of thousands of pounds per square inch. Salt deposits find weak places in the rock, and start squeezing upward in plumes, called “salt domes.” These extrusions come nearer the surface, making the salt more accessible so it can be mined. When I lived in Louisiana as a kid, I remember the salt mines being an everyday topic of conversation. The salt is not only used for food, but has many industrial uses as well. During World War Two, the salt mines provided essential minerals used in the manufacture of ammunition and high explosives. Salt mining in Louisiana has been going on since before the Civil War. Some of the mine shafts go down as much as ten thousand feet, and some of the salt caverns that have been mined are enormous. Some of those salt dome mine caverns have been used for storing things, such as butane and natural gas under pressure. Let’s see now. We have a salt dome near the sea holding about one and a half million gallons of liquified gas under pressure at 1,000 pounds per square inch. What could possibly go wrong? Add to that an abundance of oil deposits. Drilling for oil and gas is big business along the Louisiana Gulf Coast. Drills have a bad habit of punching holes in things. The Lake Peigneur Disaster of November 20, 1980 was the result of a simple miscalculation on the part of engineers responsible for telling the drill crew where to drill. When the salt is not fractured, it retains its integrity as a vault. However, geological and human activity can cause fracturing. Additionally, mining creates a cavity, and the sidewalls must be thick and strong enough to resist side pressure from underground oil, gas and rocks. Like a crack in the foundation of a house, water can get into cracks. Water pressure at 5,000 feet is 2,165 pounds per square inch. At 10,000 feet, water pressure is 4,350 pounds per square inch. It does not take much of a crack for water to get in. At those pressures, a leak the size of a straight pin has the penetrating power of a cannon shell. Assumption Parish is south of Baton Rouge, the state capitol. A parish is the Louisiana equivalent of a county. Parish governments are supervised by a Police Jury, a body of elected citizens somewhat similar to County Commissions in other states. The Parish has a web site, a blog and a YouTube channel. Over a year ago, bubbles were observed coming from the general area of the salt dome. At first the bubbles were a mystery. Then crude oil began appearing. At that point, geologists realized the integrity of the salt dome sidewall had been breached. A sinkhole began to appear in Bayou Corne in Assumption Parish. It has grown steadily since last year, and by this past week, was about 26 acres in size. The sinkhole is due to the collapse of a salt dome like the illustration at the top of this story. Some experts on the scene make a difference between a sinkhole and a salt dome collapse, saying the latter is a far worse environmental and geological disaster than a sinkhole. Because a true sinkhole is due to erosion of rock and sand, it can only get a few hundred feet deep at most. On the other hand, a salt dome collapse has the potential to end up more than two miles deep. No matter what it is called, the hole is getting larger by the day, and after the most recent sloughing this week, workers were pulled back from the berms and service roads surrounding the sinkhole. The increased rate of sloughing off edges of the hole was making it too dangerous to stay there. An incident last week illustrated how the edges of the sinkhole are eroding away. Watch this short video made by work crews as the underwater edge of the sinkhole creeps toward a stand of 100 foot tall Cypress trees. The floating booms seen in the video were for containing the crude oil floating on the pond. Seeing these giant trees sink is not the most disturbing thing about this sinkhole. Despite the fact it is about twenty five miles from the nearest open water, the sinkhole has been exhibiting tidal wave action. That means it is probably somehow connected to the Gulf of Mexico deep underground, either through old mine shafts or cracks. Water pumping back and forth will cause more scouring than stagnant water. An unlimited water supply also means more salt can dissolve because the water will not become over-saturated with salt. No one knows for sure when the sinkhole will stop growing. Depending on who you talk to, some geologists are pessimistic about these new developments, and want to post evacuation warnings as far as 25 to 100 miles from the sinkhole. There is another concern as well. No one knows exactly how all this geo/hydraulic activity in south Louisiana will affect the maze of fault lines along the Mississippi River valley up into the Great Lakes. The most famous of these fault systems is the New Madrid Seismic Zone. If it proves to be true the side walls of the dome were breached, the situation becomes unsalvagable. Maps show that a substantial portion of Louisiana could end up underwater unless the hole stops growing.The video below shows that unusual wave action. A few days ago, Governor Bobby Jindal, with Attorney General Buddy Caldwell beside him, held a press conference in which he said the state is going to sue the salt mining company, Texas Brine. He didn’t say anything about suing any of the oil companies, such as BP. I get the distinct impression the people working on the surface at the edges of this thing are risking it all. 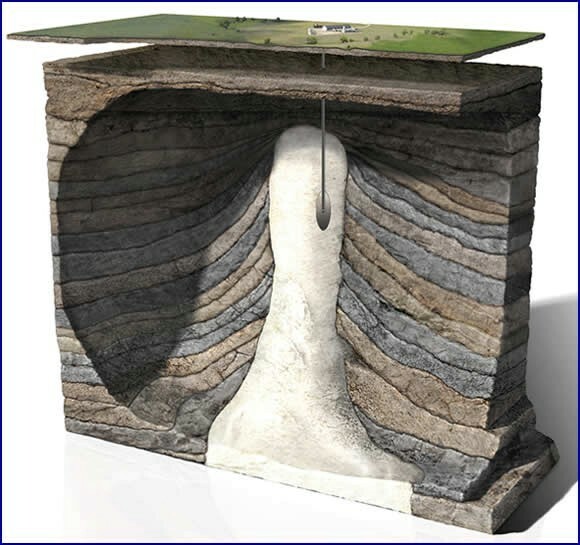 A 3-D seismic model has just been completed by the Louisiana Dept. of Natural Resources (DNR). The model refers to a “7,000 foot cliff.” That can’t be good. Local TV news story at the link. Another slough in occurred overnight on the northern side of the sinkhole. The slough in took approximately 3/4 of the north work pad and trees to the north of the sinkhole. It is estimated to be about a section of 50′ x 75′ on the north side of the sinkhole. A short video of this area will be posted on our You tube site. Although this section is on the north side, it does not jeopardize the north berm or Hwy 70 at this time. A map of the area will be posted as well to show the area. We will keep everyone posted as things develop. Updated information from BPEarthwatch. Discussion of leaking oil, gas, and Radium 226 & 228. He mentions the sounding line (shown in the comment on 6/2/1913 at 6:25 PM) was 750 feet long. Containment Berm/Roads/Sinkhole – Work on/within containment berms suspended pending approval of revised safety protocol. The latest flyover was yesterday, September 3. Thanks. I know what he said, however, that would have to be one heck of a tractor full of stuff to push water back and forth without disturbing the surface. To move debris and that boom as far as they moved, on a twenty-six acre lake, takes more displacement than any truck or loader could generate. I researched all the still and video images I could find posted, and am not satisfied with that theory. Dredd asked Thad for some documentation, but I have not seen a reply yet. This is a legal blog, and we expect extraordinary claims to be backed up with extraordinary proof. Ipse dixit won’t cut it here. I am a firm believer in Occam’s Razor. Simplest explanation is usually the best one, and I think it is convection. No ripples, no eyewitnesses, no images, no video. That video came from the Assumption Parish account. One would think the local leadership would not allow anything that misleading to be posted on their official channel. There are things about this whole event that does not pass the smell test. OS, The source of the water movement was identified as an airboat by Thad and he noted it was misappropriated from its original context in order to support a “tidal” movement claim. A big tractor or loader in a ditch full of water or a big truck in a trough cut by its progress will move water just like this when they back up and move forward – they act like a big pump. Saltwater intrusion is the movement of saline water into freshwater aquifers, which can lead to contamination of drinking water sources and other consequences. Saltwater intrusion occurs naturally to some degree in most coastal aquifers, owing to the hydraulic connection between groundwater and seawater. Because saltwater has a higher mineral content than freshwater, it is denser and has a higher water pressure. As a result, saltwater can push inland beneath the freshwater. Certain human activities, especially groundwater pumping from coastal freshwater wells, have increased saltwater intrusion in many coastal areas. Water extraction drops the level of fresh groundwater, reducing its water pressure and allowing saltwater to flow further inland. Other contributors to saltwater intrusion include navigation channels or agricultural and drainage channels, which provide conduits for saltwater to move inland, and sea level rise. Saltwater intrusion can also be worsened by extreme events like hurricane storm surges. (Wikipedia, “Saltwater Intrusion”). It would seem that “all of the above” on that list of enablers for saltwater intrusion exist in that area. You are correct the two have no direct connection geologically. The connection is that mining and drilling are responsible for both events.